March 28, 2019: Viktor&Rolf Mariage Spring/Summer 2019 is an intricate offering of bold and striking silhouettes. 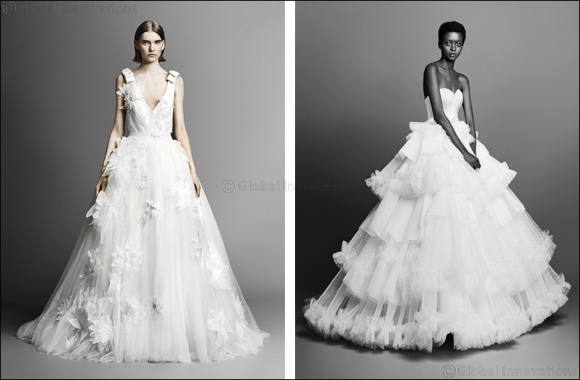 Sculptural creations are embellished with delicate embroideries and signature elements such as classic tulle, iconic bows, patchwork volumes and feminine flower motifs – a mingling which, when paired with the graphic nature of the Mariage collection, results into a typically Viktor&Rolf statement on luxury bridalwear. This season, an abundance of flowers add an ethereal touch, juxtaposing the stark nature of the collection. Lily of the valley, couture flowers inspired by the “Surreal Satin” Haute Couture show, and flower appliqué motifs mingle throughout the designs and evoke a play on opposites, complementing the outspoken designs with soft embellishments. Tulle, a staple of the Mariage collection is highlighted throughout the offering. Highlighting this essential element are two standout gowns: the “Tulle Patchwork Gown”, a voluminous creation with a dramatic patchwork of tulle volume crafted out of intricate layers of signature volants, and the “Lily Garden Sheath”, a soft and ethereal sheath dress with a crystallised ruffle neckline and an all sheer tulle overlay with intricately crafted tulle flowers and crystals.